Billionaire Oprah Winfrey is best known for hosting her own internationally popular talk show from 1986 to 2011. She is also an actress, philanthropist, publisher and producer. Media giant Oprah Winfrey was born in the rural town of Kosciusko, Mississippi, on January 29, 1954. In 1976, Winfrey moved to Baltimore, where she hosted a hit television chat show, People Are Talking. Afterward, she was recruited by a Chicago TV station to host her own morning show. She later became the host of her own, wildly popular program, The Oprah Winfrey Show, which aired for 25 seasons, from 1986 to 2011. That same year, Winfrey launched her own TV network, the Oprah Winfrey Network. Through the power of media, Oprah Winfrey has created an unparalleled connection with people around the world. As host and supervising producer of the top-rated, award-winning The Oprah Winfrey Show, she entertained, enlightened and uplifted millions of viewers for 25 years. Her accomplishments as a global media leader and philanthropist have established her as one of the most respected and admired public figures today. Produced by Oprah’s Harpo Studios, The Oprah Winfrey Show entertained, enlightened and uplifted millions of viewers for 25 years. The show reached more than 40 million viewers a week in the United States as the top-rated talk show and was licensed to 150 countries internationally. In 2008, Oprah and Discovery Communications announced plans to create OWN: Oprah Winfrey Network, the first and only network named for, and inspired by, a single iconic leader. Oprah’s heart and creative instincts inform the brand—and the magnetism of the channel. Oprah provides leadership in programming and attracts superstar talent to join her in primetime, building a global community of like-minded viewers and leading that community to connect on social media and beyond. OWN is a joint venture between Harpo, Inc. and Discovery Communications. The network debuted on January 1, 2011 and is available in 85 million homes. The venture also includes the award-winning digital platform Oprah.com. Effective July 2011, Oprah assumed the positions of Chairman, Chief Executive Officer and Chief Creative Officer for the network. Oprah’s Lifeclass is a true multi-platform experience with million of students from over 200 countries around the world engaging with Oprah on-air, online and via social media. In the popular series, Oprah and handpicked experts interact with fans worldwide in inspiring conversations about principles that guide our lives. The series, which is also live streamed at Oprah.com and Facebook, features a digital classroom with course work to accompany episode themes. In April 2000, Oprah and Hearst Magazines introduced O, The Oprah Magazine, a monthly magazine that has become one of today’s leading women’s lifestyle publications. It is credited as being the most successful magazine launch in recent history and currently has a circulation of 2.35 million readers each month. In April 2002, Oprah launched the first international edition of O, The Oprah Magazine in South Africa, extending her “live your best life” message to another broad audience. 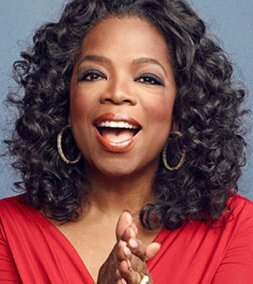 Through her company’s film division, Harpo Films, Oprah has produced projects based on classic and contemporary literature that have garnered the highest industry honors for quality acting and production. Telefilms under the “Oprah Winfrey Presents” banner have included the award-winning Tuesdays With Morrie, based on the best-selling novel by Mitch Albom and starring Academy Award®-winner Jack Lemmon and Emmy Award®-winner Hank Azaria; Their Eyes Were Watching God, based on the Zora Neale Hurston novel and starring Academy Award®-winner Halle Berry; and Mitch Albom’s For One More Day, based on his best-selling novel and starring Emmy Award®-winner Michael Imperioli and Academy Award®-winner Ellen Burstyn. In December 2008, Harpo Films announced an exclusive deal with HBO to produce scripted television programming. In 1998, Harpo Films produced the critically acclaimed Beloved, a Touchstone Pictures feature film based on the Pulitzer Prize-winning novel by Toni Morrison, which co-starred Oprah and Danny Glover and was directed by Jonathan Demme. On Christmas Day 2007, co-producers Harpo Films and The Weinstein Company released The Great Debaters, which was directed by Academy Award®-winner Denzel Washington who also stars in the film with Academy Award®-winner Forest Whitaker. The Great Debaters received a Golden Globe® nomination for Best Motion Picture. In fall 2009, Oprah Winfrey and Tyler Perry supported Lionsgate’s distribution of Precious, based on the novel by Sapphire. Oprah made her acting debut in 1985 as “Sofia” in Steven Spielberg’s The Color Purple, for which she received both Academy Award® and Golden Globe® nominations. She also has been lauded for her performances in the made-fortelevision movies Before Women Had Wings (1997), There Are No Children Here (1993), and The Women of Brewster Place (1989). She also has lent her voice to animated feature films, including Charlotte’s Web (2006), Bee Movie (2007) and The Princess and the Frog (2009). Most recently, Oprah wrapped production in the summer of 2012 on Lee Daniels’ The Butler which was released nationwide on August 16, 2013. Oprah.com is a premier women’s lifestyle website, offering advice on everything from the mind, body and spirit to food, home and relationships. It provides comprehensive resources related to OWN: Oprah Winfrey Network, The Oprah Winfrey Show, O, The Oprah Magazine, and “Oprah Radio.” In addition, the website has unique original content, including Oprah’s Book Club, which offers free in-depth reading guides for each book selection, online discussion groups and Q&A sessions with literary experts. Oprah’s Book Club quickly became the largest book club in the world, attracting approximately two million members. In 2012, Oprah’s Book Club 2.0 launched as an online reading club for the digital age. In March 2008, Oprah.com launched the first international interactive webinar series in conjunction with the Book Club selection A New Earth. The groundbreaking live multimedia sessions taught by Oprah and author Eckhart Tolle, have been downloaded or streamed more than 35 million times. For each chapter, Oprah.com users could capture their thoughts and new perspectives within their own personal online workbook. Oprah.com averages 43 million page views, 6.5 million unique users per month and has close to 7 million members. Oprah has long believed that education is the door to freedom, offering a chance at a brighter future. Through her private charity, The Oprah Winfrey Foundation, she has awarded hundreds of grants to organizations that support the education and empowerment of women, children and families in the United States and around the world. Amongst her various philanthropic contributions, she has donated millions of dollars toward providing a better education for students who have merit but no means. She also created “The Oprah Winfrey Scholars Program,” which gives scholarships to students determined to use their education to give back to their communities in the United States and abroad. In December 2002, The Oprah Winfrey Foundation expanded its global humanitarian efforts with her “Christmas Kindness South Africa 2002” initiative that included visits to orphanages and rural schools in South Africa where 50,000 children received gifts of food, clothing, athletic shoes, school supplies, books and toys. Sixty-three schools received libraries and teacher education. During a December 2000 visit with Nelson Mandela, Oprah pledged to build a school in South Africa. As that commitment broadened, she established The Oprah Winfrey Leadership Academy Foundation, to which she has contributed more than $40 million toward the creation of the Oprah Winfrey Leadership Academy for Girls—South Africa, which opened in January 2007 and now serves grades 7 through 12. Located in a 28-building campus in Henley-on-Klip, the Leadership Academy is a state-of-the-art independent school that engenders high standards of academic achievement and service leadership for girls from all nine South African provinces who show outstanding promise despite their impoverished backgrounds and social circumstances. Her vision is that the Leadership Academy will help develop the future women leaders of South Africa. On January 21, 2012, seventy-two students became the first-ever graduating class of the school. In a 1997 episode of The Oprah Winfrey Show, Oprah encouraged viewers to use their lives to make a difference in the lives of others, which led to the creation of the public charity Oprah’s Angel Network in 1998. Oprah’s Angel Network raised more than $80 million, with 100% of the donations funding charitable projects and grants across the globe. Oprah’s Angel Network helped establish 60 schools in 13 countries, create scholarships, support women’s shelters, and build youth centers and homes—changing the future for people all over the world. The Angel Network distributed its final grants, six $1 million donations to U.S. charter schools, in September 2010. Oprah’s commitment to children also led her to initiate the National Child Protection Act in 1991, when she testified before the U.S. Senate Judiciary Committee to establish a national database of convicted child abusers. On December 20, 1993, President Clinton signed the national “Oprah Bill” into law. With a winning track record, Harpo Studios co-produces top-rated syndicated television programs including Dr. Phil, Rachael Ray and The Dr. Oz Show. The studio also creates original TV programming exclusively for OWN: Oprah Winfrey Network including Oprah’s Next Chapter, Emmy Award-winning Oprah’s Lifeclass, Oprah: Where Are They Now?, Oprah’s Master Class, Iyanla: Fix My Life and the Emmy Award®-winning “Super Soul Sunday,” as well as an array of primetime specials. Entertaining, informative and uplifting, Oprah Radio is a 24/7 destination for the listener who wants to get motivated, stay informed, and be connected with others who are striving to live their best lives. Oprah Radio, which launched in September 2006, airs on SiriusXM Radio (Sirius Channel 204, XM Channel 107) and features a broad range of daily programming from Harpo Studios and OWN: Oprah Winfrey Network, including classic episodes from the 25 year history of The Oprah Winfrey Show, Oprah’s Next Chapter, Oprah’s Lifeclass, Oprah: Where Are They Now?, Oprah’s Master Class, Iyanla: Fix My Life and Oprah’s Soul Series, an original radio program where Oprah sits down with leading spiritual thinkers, teachers and authors to talk about matters of the soul. Twenty years after she made her movie debut as “Sofia” in The Color Purple, Oprah made her Broadway debut as a producer for the Tony Award®-winning hit musical The Color Purple, which opened on December 1, 2005 at the Broadway Theatre in New York City. The show toured throughout the United States. In recognition of her extraordinary achievements and contributions, Oprah has received numerous honors, including the most prestigious awards and highest industry acknowledgments. TIME Magazine—100 Most Influential People in the World. She is the only person to have been included in all eight of TIME’S 100 Most Influential People in World lists, from 2004-2011. 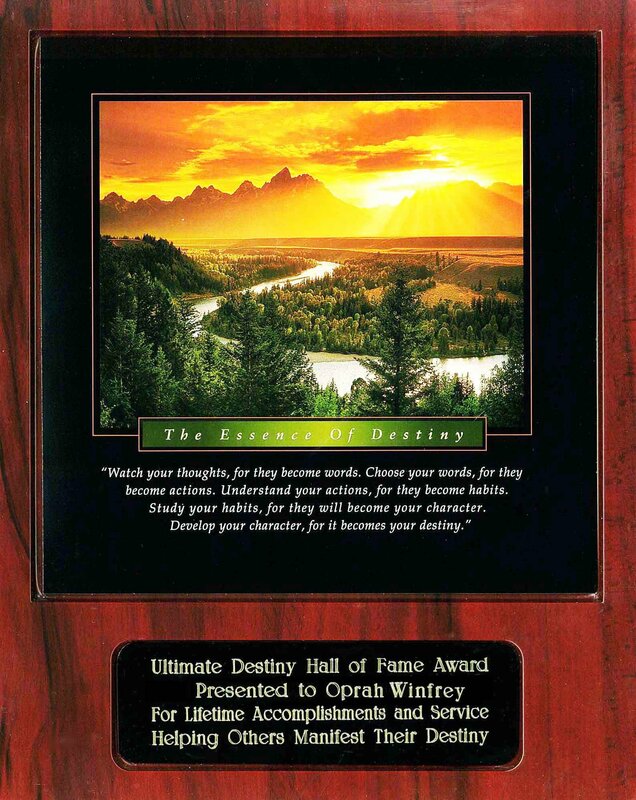 The following year, after accepting this pinnacle honor, Oprah removed herself from future Emmy® consideration and the show followed suit in 2000. Oprah and The Oprah Winfrey Show received more than 40 Daytime Emmy Awards®: seven for Outstanding Host; nine for Outstanding Talk Show; more than 20 in the Creative Arts categories; and one for Oprah’s work as supervising producer of the ABC After School Special Shades of a Single Protein.